Buy the Farm . . . Share: It's a Baby Celebration! The last two days have been pretty similar. Presumably the next 6,571 may also continue this trend. We sleep for an hour, feed them for an hour, then feed ourselves as fast as we can in hopes to get more than an hour's sleep. Repeat. I have no idea how we will possibly be able to live our lives once we actually get the babies home. In fact, I still can't believe that the hospital is actually going to let us take the babies home. Who are we? What do we know about babies? What gives us the right to take these two little guys home with us? We didn't even pay anything for them! Well, not directly. I had no intention of turning this into a parenting blog but it would be hard to gloss over these events. Besides, this blog only has about 12 readers and I think they're all related to me so they are excited to see pictures of the babies and learn of their progress. Today was all about battling to get them to eat. This is a critical time for them in that they need to eat but it exhausts them so much that you have to constantly find new manners of trickery to get them to continue eating, mostly just continually waking them up and forcing them to eat. It seems really mean but since the alternative is having them get a feeding tube put in it makes torturing your baby feel like it is for the greater good. Martin spent the majority of yesterday wearing his cool guy shades under the light. Today it was Elliott's turn. While Martin kind of enjoyed this experience Elliott was less enthusiastic. This is the only shot of him we could get where he wasn't wailing and trying to tear the shades off of his head. The guys both had a horrible time of feeding this afternoon. It was worrisome because neither of them seemed to want to eat at all. We were worried until at their 6:00 PM feeding they both sparked into life like the pair of ravenous wombats that they are. We were happy because the normal 90 minute feeding was going to be cut back to a mere 30 minutes. That was until both of them started fussing and screaming for seconds and thirds until we reached the 90 minute mark anyway. Elliott even needed to be tricked into stopping so that we could get out of the NICU for their shift change. Their new found enthusiasm for eating made us both feel a little more at ease. When we got back to our room we found our celebratory meal waiting for us. 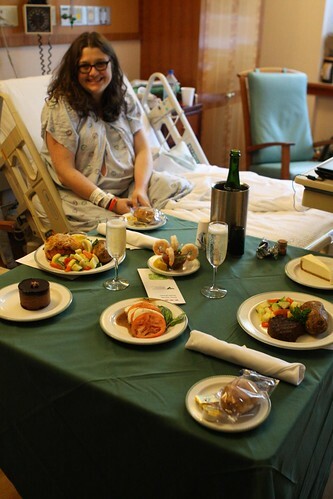 The hospital we're at made us a dinner with boiled lobster, grilled filet mignon caprese salad, shrimp cocktail, chocolate ganache cake, and New York style cheesecake. They even served up champagne along with a brochure about what new moms should include in their diet. This kind of sent a mixed message but was appreciated nonetheless. This was a nice perk, one that would not have likely been included in any of the packages of the hospitals we looked at outside of this one. I've got to say that the staff at this hospital has been nothing short of amazing. Truly my only complaint was about the crazy ingredient listing in the dinner rolls. Let's face it, I usually don't have to try very hard to find things to complain about. Maybe it's the hospital, maybe it's the high of new parenthood, maybe it's the sleep deprivation, but this was all seeming pretty good. Also, the champagne helped take the edge of the realization that soon we would be taking these little guys home. That's right, the hospital was just letting us take these guys home knowing full well that we have no idea what we're doing! That seems like pure negligence from where I'm standing. Yup. Things are about to get tough.